The Iona Institute has said the proposed abortion law by the Government is not restrictive compared to other jurisdictions. Speaking at an Iona Institute press conference this morning, lawyer Maria Steen said the proposed legislation would be almost identical that pertains in the UK at the moment and in other European countries. The Christian advocacy and research body is backing the retention of the Eighth Amendment in the referendum on 25 May. "The Government cannot have it both ways", Ms Steen said, "it cannot on the one hand, say that it wants to bring Irish law into line with other European countries and then say that the high rates of abortion that pertain in those countries won't result here". Director of the Iona Institute David Quinn said under the proposal, GPs will be handing out the abortion pill and 90% of abortions take place in the UK in the first three months. Mr Quinn said by the end of three months nearly all abortions will have taken place, and there will be few abortions taking place between three and six months. "We can't claim a law that will permit 90% of abortions to take place on request is in anyway restrictive", he said. On the right to travel, Mr Quinn said Irish people travel for "all kinds of things that are not legal in Ireland", and he said the institute was not seeking to stop that happening. He said British law should not be taken as a model for Irish law anymore than French or Dutch law. However a Professor of Global Legal Studies at the University of Birmingham has described the proposed abortion legislation as "restricted and regulated". Irish academic Fiona de Londras was speaking in Dublin where she attended an event organised by Fine Gael seeking to "debunk a number of myths in relation to the Eighth Amendment". Prof de Londras said the difference in what the Government is proposing is that the woman will not have to explain herself to anyone to access abortion in the first 12 weeks. "Unlike in some other countries you won't, for example, be able to walk into a pharmacy and buy abortion pills, you'll have to go to the Doctor and they'll have to certify it's 12 weeks since the first day of your last period and you'll have to wait for three days with legal certainty about the right to access abortion". Prof de Londras said that time period will allow the woman to focus on the decision without worrying about the law or practicalities. On the question of abortions on the grounds of mental health, Prof de Londras said there are more restrictive grounds in Ireland after 12 weeks compared to Britain where, she said, in some cases it is lawful in England to have an abortion without time restrictions. Barrister of Law Benedict O'Floinn accused those seeking to repeal the Eighth Amendment of "a resounding silence" regarding the restrictions being proposed in the Government's legislation on abortion. 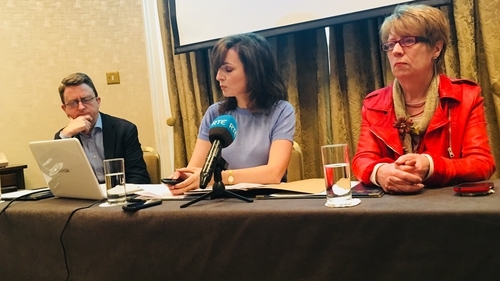 Speaking at a Love Both Campaign press conference this afternoon, he said there had been "a resounding silence" in relation to the exact legal basis of the restriction, and how it would withstand challenge. "What's being proposed here is to sweep away the rights of the unborn, we know that because of the M decision (M vs Ireland Supreme Court Judgement) and we're not being pointed to the legal basis for what's being said". Mr O'Floinn said lawyers seeking to retain the Eighth Amendment are questioning the restrictive proposal that the yes side is talking about and how it would work. "From our analysis", he said, "we don't believe it's going to work". Love Both Campaign spokesperson Cora Sherlock said that, in recent days, there had been deliberate misinformation about the Irish healthcare system. Ms Sherlock criticised Tánaiste Simon Coveney who she said was "deployed by the Government to cheerlead for abortion on demand". She said that, at a Yes event in Cork last weekend, Mr Coveney gave assurances that there were restrictions in the proposed legislation including counselling, secondary scans and alternatives to abortion. However, Ms Sherlock said none of the restrictions outlined by the Tánaiste appear in the published bill. "Simon Harris has given us his abortion blueprint and Simon Coveney doesn't appear to have read it", she said.